Here in the DaddleDo household, the laundry never ends, and the piles never seem to subside. The thing is though, no matter how much laundry gets done, there are always at least fifteen socks that don’t have a match. What makes this really weird is that whenever we buy socks, we specifically buy colored toe lined socks so everyone has their own color, which should make for an easy task at matching time. As most of you are probably aware from your own experience, this seemingly easy task is usually more like sitting down in front of a 5000 piece puzzle without any edge pieces, and just as “puzzling,” as there are often weird colored, no colored, or just completely wrong socks in the pile. I feel like this issue has been going on since the beginning of time or at least since I was born, which was sometime in the 1900’s, ya know the olden days. I feel like my mom constantly had this problem as well, but those memories are fuzzy, I wonder if my brain has been wiped of my involvement as a child? The washer and the dryer are in a competition to see who can steal the most socks without getting caught. No matter what we are wearing at any given time, there is a random sock stuck inside a piece of our clothing. Right now you are wearing an extra sock somewhere on your body. Well we may never know where they go, so instead we are giving 1 lucky winner the chance to get some matching pairs of socks or anything else you may want with a $25 Finish Line gift card. Those are some great theories! I’ve always wondered where the socks go! Ahh I like the other dimension theory nice one! I think they go to a better place…like my dryer vent. I think they go under the washer/dryer or some other piece of furniture. I think they’re hiding in witness protection. I think they go to sock heaven, then that leaves me in sock hell. I think they feed Sid the Sock Eating Monster. I think they go behind or beside the washer or dryer. Thank you! I think my Dryer eats them!! Ever since “Hey, diddle diddle” when the dish ran away with the spoon everyone has been very hush hush about where the socks go. But we know they go, well, somewhere. I think they are cannibals and eat each other. There’s no more logical explanation, is there? There’s a portal from both my washer AND my dryer that goes to a mystical, magical sockland, where socks all dance & eat ice cream forever & forever! They are being used to free house elves. I think they go into the Twilight Zone. 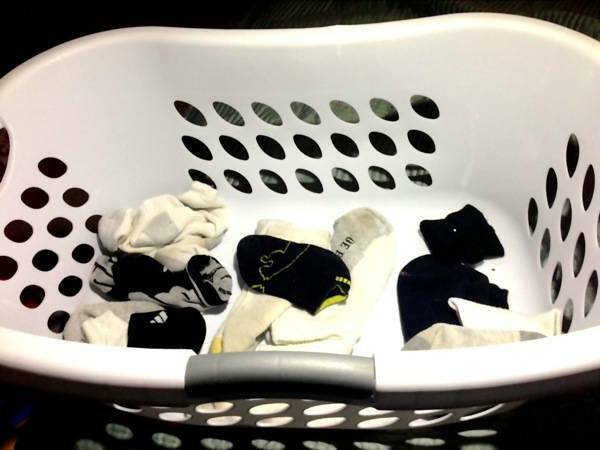 I don’t think they make it to the laundry – they are under someone’s bed, in their closet or in the trash. My husband has them thrown all over the room so when I pick them up I must not see them all, grrr. I’m pretty sure they are sucked into a vortex to the bowels of Earth. I think they just get lonely and go home. Our missing socks usually end up in anyones drawer and then we are all trying to find who they belong to! The worst is when no one claims a sock! Oh I think our washing machine eats them!!!! But…my other theory is the dogs eat them! LOL…not sure yet who is the culprit! I believe that the bigfoot steals them and takes it back to his cave so he can use them for a mattress. They sneak out and runaway to a huge sock party! I am sure they is a gremlin living underneath the washer. Sometimes I think that there is a Sock Troll who lives in washer hoses and comes to steal them. I think most of mine get stuck to or inside other clothing. I think other members of the household mistake them for theirs and we end up with a lot of lone socks. I suspect that our favorite laundry detergent is simply too strong for our funky smelling socks i.e. it dissolves them in the wash ! I think the dryer is eating them, i swear it is. I think they get dropped on the way to the washer. Or it gets sucked into the time warp thingie. They get stuck in that time warp thing. They get go to sock heaven!